It’s been an up-and-down 2017 for rising heavyweight star Francis Ngannou. In January, Ngannou, who at the time was a perfect 4-0 in the UFC with four finishes (and 9-1 overall in his MMA career), got a huge step up on television when he fought at UFC on FOX 23; his opponent was former UFC Heavyweight Champion Andrei Arlovski. Ngannou didn’t even need a full two minutes to pick up the biggest win of his career to date, as he brutally knocked out the legend Arlovski, emerging as a serious threat to the heavyweight title in the process. The win over Arlovski immediately thrust Ngannou into title contention in a shallow heavyweight division, though most figured he needed a top-five win to get a title shot against current UFC Heavyweight Champion Stipe Miocic. The opportunity for that win came knocking when Ngannou was booked against former champ Junior dos Santos at UFC 215. Though JDS was coming off of a KO loss to Miocic at UFC 211, beating him was still considered the litmus test for getting a title shot at heavyweight, and so it was really good matchmaking on the UFC’s part to book that fight. Unfortunately for everyone involved, the fight never came to be because JDS failed a USADA drug test in the leadup to UFC 215 and was pulled from the card. With no opponent for Ngannou to fight on short notice, the UFC took the Cameroonian-born Frenchman off the card completely and instead booked him for the fight this weekend at UFC 218. His opponent will be none other than Alistair Overeem, one of the best heavyweights in the world,who is coming off of back-to-back wins over Fabricio Werdum via majority decision and Mark Hunt via brutal KO. In many ways, it’s a harder fight for Ngannou than a diminished JDS is, and if Ngannou wins this fight, there’s no denying him the next title fight against Miocic, especially with former champ Cain Velasquez not in the title picture these days. Still, it’s been quite a crazy year for Ngannou. With the UFC desperate for stars these days it’s surprising that Ngannou never had a fight booked between January and September. Yes, there aren’t too many options in the heavyweight division, but you’d think the UFC would want Ngannou to have headlined a few Fight Night cards in that time period to build his name a bit. After all, he's easily marketable due to his hulking physique and his exciting fighting style, so it's a bit surprising he was on the bench for so far, but the fact he is the co-headliner at UFC 218 shows the promotion does believe in him, and this fight against Overeem on such a big card is a tremendous opportunity for Ngannou to shine on the big stage. Should Ngannou defeat Overeem (and according to the Vegas odds he is the clear favorite to win the fight) it would make sense for the UFC to book him against Miocic sometime early next year for the heavyweight title. Miocic hasn’t fought since his last fight against JDS in May due to a contract dispute, but he’s reportedly closer to coming to terms with the UFC on a new contract. When he does so, he’ll need a dance partner, and the winner of Ngannou vs. Overeem makes a lot of sense, especially if it’s Ngannou, because that’s a fresh matchup for Miocic, and depending on how he beats Overeem, the fight could sell itself. 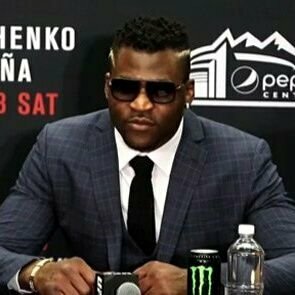 Knowing how charismatic Ngannou is, it’s likely that if he is victorious this weekend in Detroit that he will call out the champion for a shot at his belt. UFC 218 is Francis Ngannou’s time to shine. He’s had a tough year because of inactivity due to a shallow division and one of his opponents testing positive for PEDs, but he has a brilliant opportunity here to take on Alistair Overeem and get a huge win over a big name. 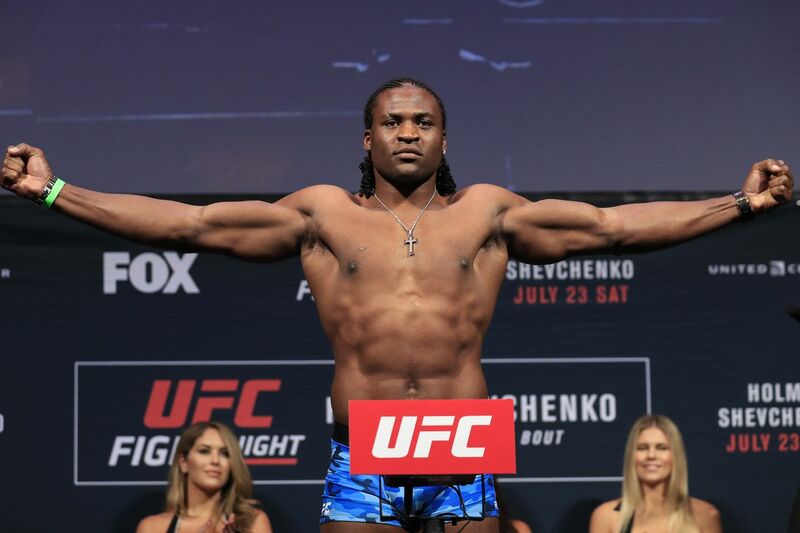 Ngannou is one of the rising stars in the sport, and now he just has to go out there and show it. Considering the state of Overeem’s chin and the massive power in Ngannou’s fists, there’s a good chance he does just that.